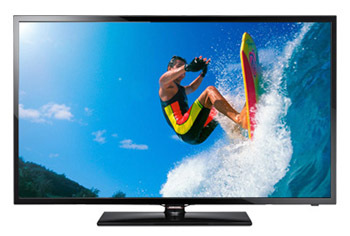 The UN22F5000 LED TV is one of the smallest from Samsung this year. The 19 inch F4000 is the only smaller TV. This is a strange little 1080p set. For regular programming, a television of this size does not really benefit from the full HD screen. It would even be hard to see the difference in a 1080p blu ray. The real usefulness of this becomes clear when a computer is hooked up to it. A 1080p monitor allows much more work space than a 720p monitor. 22 inches is a great size for a monitor as well. Think of it as a monitor with a TV tuner built in. At just north of $200, it's not such a bad deal either. This would also be a great TV for a kid's room, office, kitchen or dorm. The picture quality on the UN22F5000 is not bad for missing all of the top tier features, especially when you consider the price of the TV. The powerful led back lighting is the reason for this. It produces a bright and clear picture with bright whites and strong contrast. Color is a strong point, but it can also have moments of over saturation to the point of looking unrealistic. It is easy to enter the picture settings menu to turn down the back light setting a bit to keep this problem in check. Side angle viewing on the UN22F5000 is on par for a TV in the value category. Contrast and color begin to degrade at about 30 degrees either from left to right or up to down. This is typical for LCD/LED TVs and this one is not plagued by terrible viewing angles. Of course the best viewing position is front and center, but that cannot always be the case for everyone watching the TV. The UN22F5000 looks just like the F5500. For a value model like this one, the look is pretty good. Samsung calls it the Slim Design. It ends up being very similar to the EH5000 from last year. Bezels surrounding the display are thin to give the TV an updated appearance. The square stand is nothing new. The profile is a bit thinner compared to the 5000 series from the previous year. Everything is a glossy black plastic. It's nice to see the low end TVs looking so good.